Sidney Lumet's Murder on the Orient Express is packed with great actors. It has a good and interesting (despite being a bit narrow) plot based on a book by the world famous Agatha Christie. The director is arguably one of the best directors that have ever lived. The costumes and all other details are carefully crafted. And pretty much everything seems to be perfect at first glance. Then it's quite strange that although plenty of people like this movie, there are many that nearly hate it. The main reason probably lies in Albert Finney's representation of detective Hercule Poirot who creates a distinguishable character which is easy to be loved but equally easy to be hated too. Multiple Oscar nominee (incl. 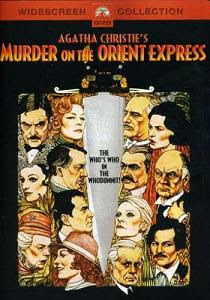 for his role in Murder on the Orient Express) Albert Finney presents a really notable Hercule Poirot. He is intelligent but arrogant. He does not show sympathy for everybody. He could be gentle and charming with ladies yet impolite and restrained with particular men. He speaks with accent and sometimes it's hard to understand what he is saying. He manifests a sense of humour but he is also capable to be plain serious. He is a bit annoying at times and overly self-confident most of the time. All this translates to a character that could be simultaneously enjoyed and disliked depending on different people's perceptions. While Finney gives quite a distinctive performance of Poirot, the rest of the all-star cast has not been misused either. Lauren Bacall as Mrs. Hubbard plays an important part constantly providing Poirot with clues and pieces of evidence. Martin Balsam enacts the train line director Bianchi who shows a lot of concern for the future of the Orient express after the murder has been committed on his train. Ingrid Bergman gets her 3rd Academy Award for a convincing (yet small) role of religious missionary in this movie. Jacqueline Bisset, Vanessa Redgrave, Wendy Hiller, Sean Connery, John Gielgud and Jean-Pierre Cassel are only some of the other renowned actors that make great portrayals in the film. The movie exposes the life in 1935 with very typical shades. Almost all of the colorful and rich characters are very snobbish. The vehicles, the papers, the costumes are well selected and fits perfectly in the epoch. Sidney Lumet creates enough suspense although he has made tenser movies. The tight environment determined by the dimensions of a train car could call forth some parallels with Lumet's 12 Angry Men but this is quite a different film. In fact, the lack of space here probably furthers any theatrical resemblance that the acting could prompt eventually. Another moment that could dissatisfy some moviegoers is the fact the ending revelations are not quite naturally coming out of the investigations presented in the film. Still, this is a common "feature" of most of the movies based on mystery books (a recent example could be Tinker Tailor Soldier Spy) so it's not such a specific flaw of Murder on the Orient Express. Despite its shortcomings this is a solid film. I can see where both its admirers and their opponents are drawing arguments from but it's a movie that is worth a look even just because of its (kind of a controversial) ending.